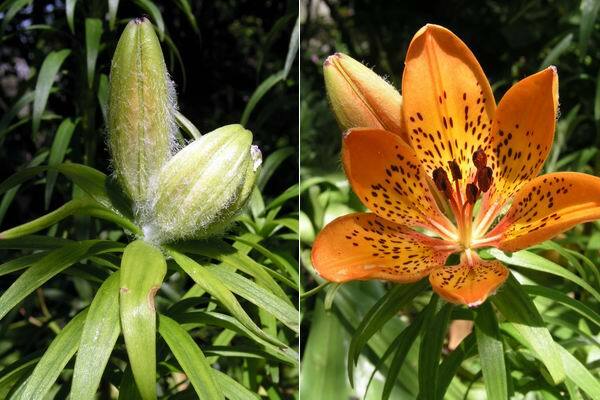 I showed you the furry buds of Lilium dauricum a few logs back and now they have extended and the first ones are in full flower. 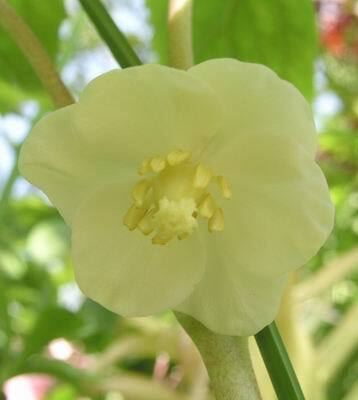 This short stemmed upward facing species has been much used by the hybridisers. Our own cross between Corydalis elata and Corydalis flexuosa is again in flower. 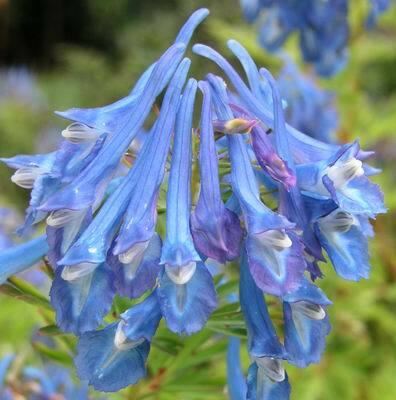 Corydalis x 'Craigton Blue' has deep blue flowers which have a beautiful scent reminiscent of honey. 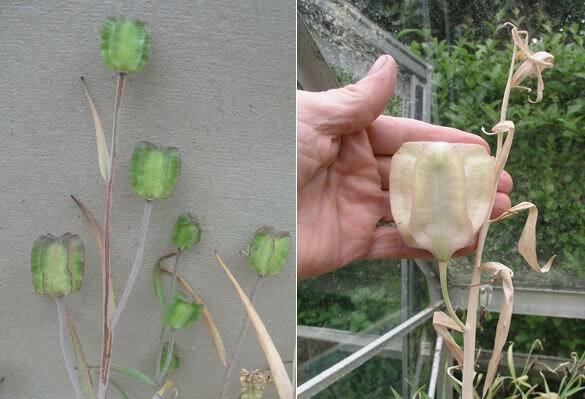 I will continue on the theme of just how far I can push the term 'bulb' by showing the nodding flowers of Podophyllum peltatum, the American cousin of Podophyllum hexandrum. It spreads by means of stolons and it could become a pest if you are trying to grow it with choice dwarf plants but it is fine growing among the medium to large Rhododendrons. It shares the same space as some of the early flowering Corydalis, Iris, Crocus and Galanthus which are all starting to go dormant now. The flowers hang down under the leaves, just like some of the trilliums. 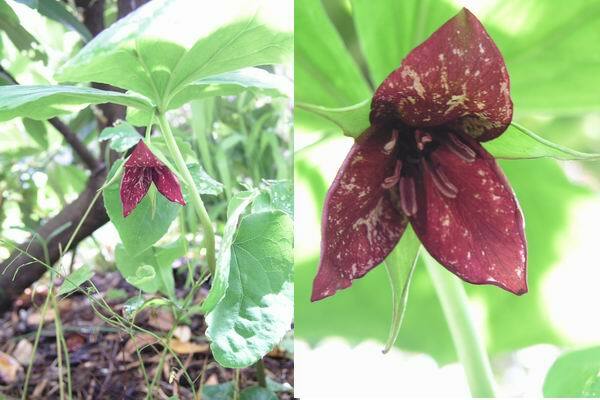 Trillium vaseyi is one of the nodding trilliums and here the flower is just starting to open. 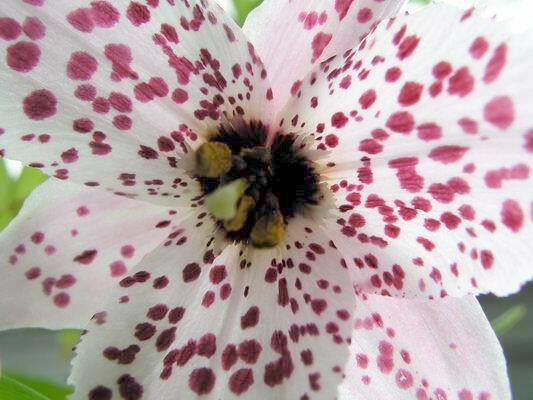 This form has a nice speckled maroon flower. Collecting seed is still the first job each day and it is the Narcissus that are ripening now. 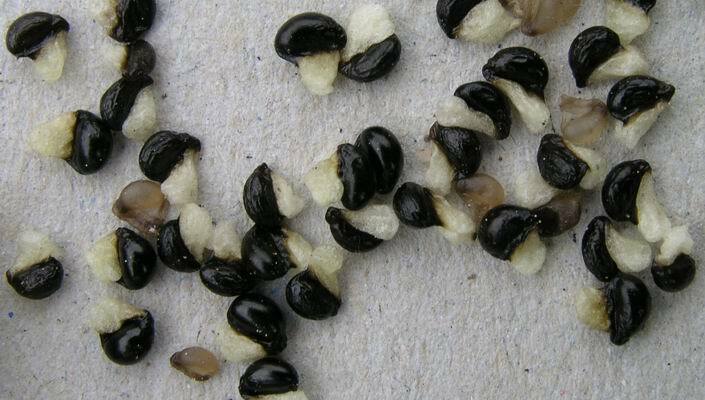 It is best to collect the seed just before the capsule bursts and sheds the seed everywhere, unless of course they are growing in the garden and you want that naturalized look. All these capsules are now ready for harvesting. You can see that the most advanced are starting to go yellow and if you squeeze them very gently you will feel that even the greener ones are starting to go soft to the touch - they feel firm before they are ripe. The seed is back and shiny when ripe and white before it is fully ripe - the few small translucent seeds are unfertile. The next question is when is the best time to sow the seed ? The ideal answer is to sow it now into dry compost (half way down the pot) and keep the seed pot dry under glass, just like the mature bulbs, and water it in September. I do not always have time or space to do this so I store the seed in a packet with plenty dry sand. 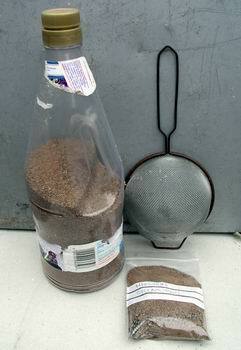 I pass the dry sand through a domestic sieve and store it in a bottle ready for seed collecting time. When I come round to sowing the seed I can either sow it complete with the sand, or, pass the sand back through the sieve which will catch the seeds which are too large to pass through the mesh. 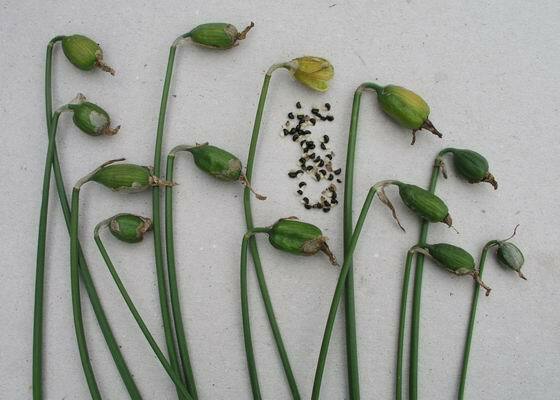 On the left I wanted to show you these seed pods on Fritillaria affinis tristulis, usually described as sterile. I have never agreed with this statement, in fact I never like to say a plant is sterile I would rather say it is not very fertile, and this is the case with tristulis. Some of the seed pods expand most years and they usually contain a portion of fertile seed - not the full pod full I expect from a normal frit, but it is not sterile. The giant pod on the right is from Frit severtzovii, the form 'lillie flora' that I got from Janis Ruksans, This is the first year that it has set seed for me. It is also Nomocharis time with the form we have been used to calling Nomocharis mairei characterised by the intense amount of spotting on the inner and outer petals. 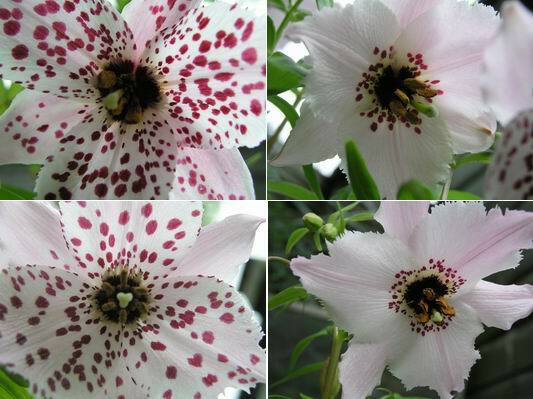 It is now lumped in with Nomocharis pardinthina which when you look at this group of seedlings is probably the correct way to go - we can still select out the very spotty forms. This is just four of the forms from this batch of seed - they are all beautiful. 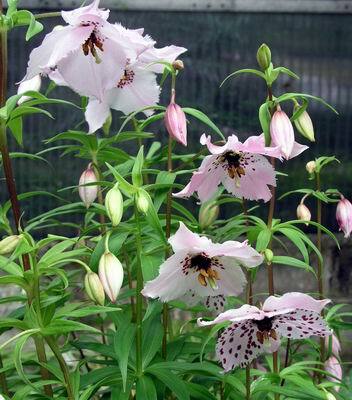 I must add that this is our own garden collected seed and I find that the Nomocharis are very promiscuous and hybridise freely so I would not say that these necessarily represent the true species. 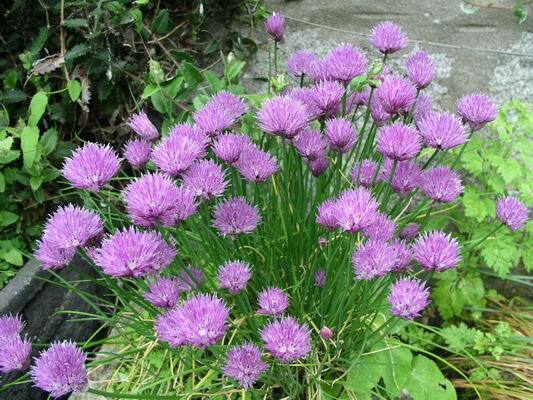 I thought that I would finish this week on a common garden plant, Allium schoenoprasum or chives, as we know them, for chopping into salads, one of the few food plants we still have room for - well it is a bulb ! !